Nathan Camp is back with his second article in the JSON series. In an earlier article Nathan discussed the general basics of what JSON is and how it is being used to replace XML in a growing number of cases. In this article he goes through some use cases. JSON’s simplified, smaller scale structure is leading the way to more interactions between data sources. According to Programmable Web about 50% of API’s use JSON and the rest XML. But we also confirmed that the rise of APIs is not infringing on EDI’s turf. So now that all of my EDI integration friends are breathing easier, let’s look at how our old EDI skills can be stretched to new world capabilities through adoption of JSON and API connections. As an EDI integration specialist, you should be excited about this breakthrough. As a small example of how APIs and EDI might interplay, my friend, Keith Severson, sells crutch pads online at Propel Mobility. Let’s say one day I went for a surf, I hit some kelp, I flew off the front of my board, my board did not move, my leash was attached, my knee popped out of place, and I needed crutches for three months. After two weeks on regular crutches, I had new pains in my neck, sore wrists, and bruises under my arms. I decided it was time I bought my friend’s crutch pads to ease my pain. I am now on Keith’s website, my shopping cart is loaded, and my credit card number has been entered into the order form. Got all of that? So my overly complex background story leads to a highly coordinated dance of data across multiple systems and formats. When I click “Submit Order,” my order is placed in Keith’s Magento e-Commerce system. Keith’s e-Commerce system handles the payment authorization and order notification back to Magento. Keith now needs to fulfill this order, so he pulls the information from his eCommerce system through an API, and before placing the order in his ERP system, he wants to verify that I typed my address correctly. 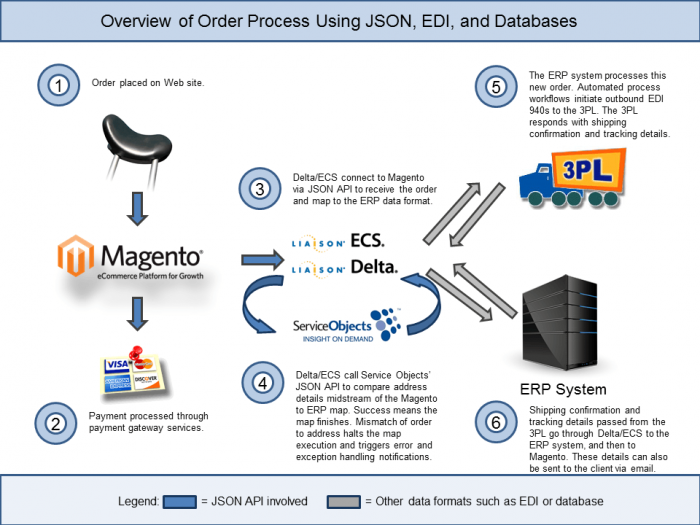 In Liaison Delta and ECS, in the middle of running the data translation map that converted the shopping cart order JSON format to his ERP’s database staging tables, he invokes an API to call an outside firm named Service Objects which can be used to verify my address. This simple, little step will eliminate countless hours of lost time and dollars of expenses sending packages to the wrong location. Even more important, Keith’s customer happiness and loyalty will be increased because he has knocked out one more disruption to the order fulfillment process which could delay my receipt of my crutch pads, though I was the culprit that originally caused the error. Upon confirmation, my order goes into his ERP system. From here, Keith’s ERP system now recognizes a fulfillment request, which then sends an EDI 940 (warehouse shipment order) to his 3PL (third party logistics) provider for fulfillment. (Not pictured above) Keith also uses the same JSON message from his eCommerce system to update both his CRM (e.g. Sales Force, Sugar, Zoho) system and HubSpot marketing automation system so I can receive ongoing contacts from Propel Mobility about how to use my crutch pads better and offers for additional goods that will help me in my recovery. These kinds of scenarios are being implemented across a diverse range of clients and industries today. For an idea of just what kind of data is available, take a look at Virtual Logistics’ list of API connectors they are building for their client community. Virtual Logistics has been quick to adapt and adopt new capabilities that extend their clients’ Delta and ECS tools to new connections. Virtual Logistics can easily help their clients exchange EDI with their supply chains and logistics providers. In the sales and marketing side of the business, Virtual Logistics can do many tasks across on-premise or Cloud systems through non-linear business process management. Virtual Logistics’ early move towards non-traditional uses of Liaison Delta and ECS has allowed them to provide some very interesting new integration options for their clients, as highlighted in this Listen to Your Gut Case Study. Yes, these are pretty exciting example of just how forward looking companies of all sizes can and should take advantage of and use the data sources they are sitting on. Using your existing middleware solutions to broader capabilities is how you keep your companies competitive, and you, as a data integration specialist, stay on the leading edge of IT, marketing, and sales. VL will be launching its connector series very soon and in the collection will be some uber neat JSON connectors including Hubspot, Leadsift and a few others. So stay tuned.